Altiplano Tipis overlooks the picturesque mountains and forests of the surrounding area and is situated within an attractive courtyard. Our guests can experience boutique accommodation with a dash of luxury. Each tipi has a double luxury camp bed (or 2 single camp beds if preferred) with feather duvet and a private shower room within the cave complex complete with towels. Or alternatively, experience living in a cave dwelling, complete with ensuite shower room, veranda and a woodburner for the chilly winter evenings. Living within an earth structure keeps the rooms ambient all year round so there is no need for air conditioning. Our water is heated using a solar powered system, reducing our need for conventional fuels and only biodegradable products can be used on the site as the wastewater is then used to water the trees and flowers in the courtyard conserving precious supplies of water. Local and organic products can be bought on site. Our guests can make their own meals using the outside kitchen facilities or BBQ. We also offer a solar powered oven. We provide advice on activities in the area which allow our guests to appreciate the beautiful countryside of the surrounding area known as the Lake District of Spain. Or for something less energetic our guests can simply relax with a good book or take a dip in our above ground freshwater pool. Our guests can experience luxury camping in one of our three beautifully crafted and fully equipped tipis, enjoying an outdoor camping experience with a dash of luxury. 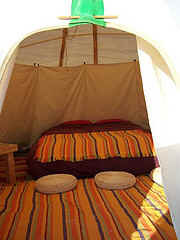 Each tipi can accommodate two adults, (a small child can also be accommodated in each Tipi). The tipis are equipped with a comfortable double camp bed (or 2 singles) with feather duvet, a private shower room within the cave complex complete with towels. There is a basket for our guests to store their belongings and locally made rugs for your comfort. We provide oil lamps for the evening. 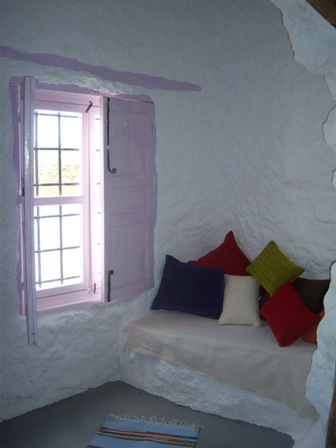 Experience living in a cave dwelling, complete with en-suite shower room, veranda, shared outdoor kitchen and a woodburner for the chilly winter evenings. The cave dwelling is cool in the summer without the need for air conditioning due is naturally cool interior. The cave dwelling can accommodate two adults. Our outside kitchen with BBQ, gas hob, sink, fridge, pots and pans, crockery and cutlery is available for our guests to create their own culinary delights. We offer a selection of organic and locally sourced items including eggs, fruit and vegetables on site (fruit and vegetables need to be ordered in advance) which can be used to create delicious meals using the solar powered oven or the outdoor barbecue or gas hob. There is also a weekly market in the nearby town of Baza where our guests can buy fruit and vegetables and other Spanish delicacies. We offer a continental breakfast which is included in the accommodation cost, with coffee or tea and fruit juice, and which is laid out under the shade, with additional items in the fridge for you to help yourself. Or for a real pampering why not have us bring breakfast to your tipi, or cave. Breakfast is brought to your tipi or cave and left outside your door, listen out for the chime of the goat bell, at the time of your choice! For lunch or evenings, we can provide you with a simple choice of tapas. Vegetarian is a speciality, and we use free range, organic or local produce. We also offer packed lunches. A simple lunch in a back pack for walking, or a more elaborate one for a drive out to the sierras . For a small fee per load we offer a washing service. We provide advice on activities in the area which allow our guests to appreciate the beautiful countryside in the surrounding area known as the Lake District of Spain. There are many things to do in the area including cycling, walking, bird watching, horse riding and exploring the traditional Spanish villages, there is something for everyone. Or for something less energetic our guests can simply relax in our large courtyard with a good book or take a dip in our above ground freshwater pool looking out towards the mountains. We have bikes to hire for our guests to use to explore the local area. 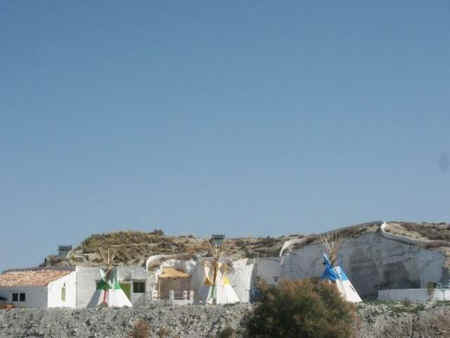 Altiplano Tipis are based 4km from the market town of Baza in the stunning countryside where one can enjoy peace and tranquillity for a relaxing holiday. Baza itself boasts a rich and historical past, where one can spend a pleasant day strolling around the numerous shops and cafes, a museum, a theatre, cinemas, and view the abundant historical buildings. Every Wednesday there is a large market, one of the biggest in the area. Here you can find small market stalls where the locals come to sell their freshly grown produce. Granada is only an hour's drive away, and the famous Alhambra Palace as a tourist destination is not too far for a day's visit. 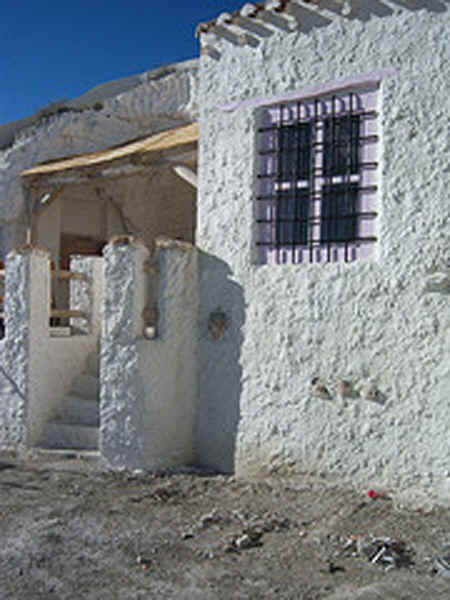 Baza is surrounded by unique villages with plenty to offer. Zujar for it's hot baths, Orce with its cobbled streets and nearby archaeological site, the quaint town of Caniles with its beautiful square where you can savour Spanish culinary delights at the small cafe on the square. Only half an hour’s drive away is the troglodyte market town of Gaudix with its stunning Cathedral. Nearby is the village of Purrellena famous for its pottery, where you can pick up a bargain. For water lovers, just 20 minutes drive away is the beautiful Lake Negratin. Our guests can hire our kayak boat for a day on the lake, suitable for two children and two adults. At Lake Negratin one can enjoy a variety of water sports, swim at the beach, or just relax at the beach side cafe and take in the stunning views across the lake and mountains. The area has several national parks, where there is abundant flora and fauna. The outstanding Sierra de Castril, with its rugged limestone mountainous region, is situated above the white washed village of Castril. There is a visitors centre 200 metres from the town and signposted walks. After a hard day’s stroll, no better than to return and sit outside one of the local bars with a cool drink and a tapas. Sierra de Baza national park is mostly pine clad with rugged mountainous terrain. The highest point is Santa Barbara 2,271m above sea level. There are many abandoned villages and farms scattered throughout the park. Inhabitants of the park include eagle owls, Egyptian vultures, hoopoes, kestrels, wild cats, badgers, and plenty of roe deer and boar. Skiing in the Sierra Nevada area is only an hour away and provides a fantastic activity in the winter months. From our site you can take a walk along the various tracks, across the countryside and explore the many derelict caves that surround us. You can walk to the outlying hamlets where many of the caves have been reformed. Stroll through the shaded paths of the Alamo trees, where the sound of bird song and the rustling of the trees are mesmerising. Bikes are available to hire and are a great way to see the countryside along the quiet roads and tracks. Take a picnic lunch and make a day out! 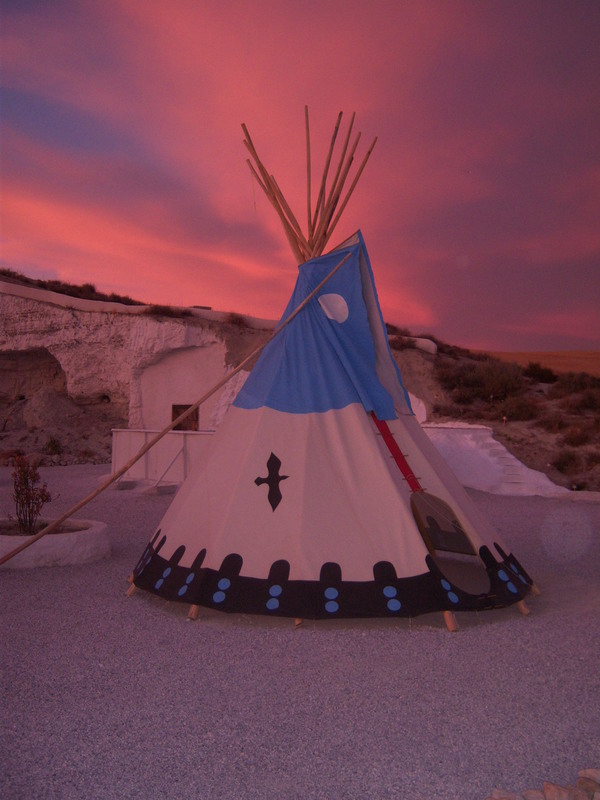 For our opening year we are offering our tipis at 36E per night based on 2 persons sharing. Plus 10E per night per for one child. Our offer ends 30th Sept 2009. All prices are based on two people sharing based on self catering but including a continental breakfast. All prices are based on self catering with continental breakfast included, for up to two people sharing. An additional small child per tipi can be accommodated. How About Booking Our Whole Site For Friends, Family Or Corporate Weekend! Change over days are flexible as is time of arrival.